Fallon VA is a gorgeous grey filly with huge eyes. She is by Shahim Al Nakeeb a straight Egyptian Stallion who has a rare combination of exotic type and movement. 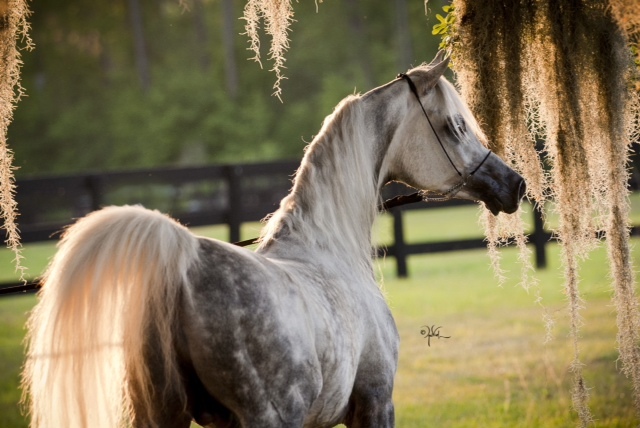 His sire NK Hafid Jamil is regarded as one of the most exotic stallions alive today, known for producing extreme head type characterized by large eyes, small muzzles and tiny tipped ears. His dam, Shameerah was Senior Champion mare at the Egyptian event and is known for her size, beauty and wonderful movement. He carries the blood of Dr. Hans Nagel's renowned Katharinenhof Stud of Germany, as well as proven bloodlines from the best American Egyptian programs, such as Ansata, Bentwood. Gleannloch and St. Clair. Shahim Al Nakeeb is a stallion whose pedigree is filled with horses that epitomize classic Arabian type. Fallon VA’s dam, Faarah VA was the Region 12 unanimous Spotlight yearling auction filly. Fallon VA is enrolled in the Region 12 Spotlight Futurity and US National Halter Futurity.